Anyone who has seen the Christmas classic “National Lampoon’s Christmas Vacation” will remember the famous cat vs. Christmas tree scene. In typical silly movie fashion, neither cat nor tree fared well, and the audience had a good laugh over the chaos that ensued. In real life; however, Christmas trees and decorations can present real dangers to your curious pets. 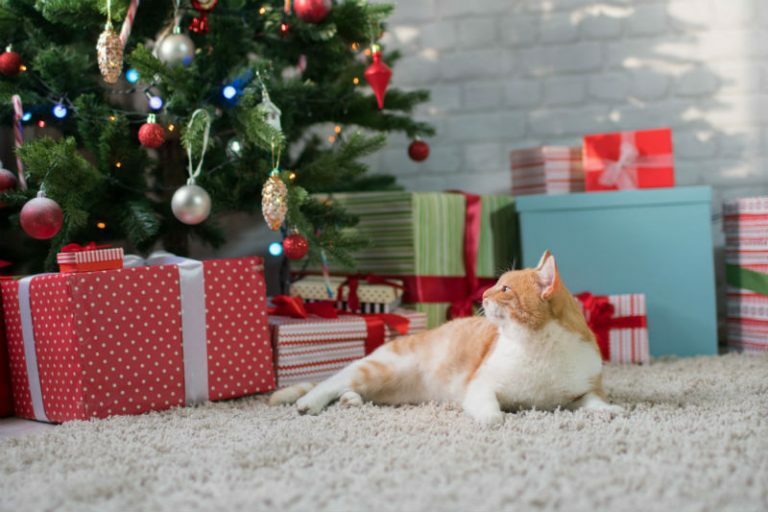 Below, we’ve listed some of the more common holiday hazards and provided some ideas to pet-proof your home for the holidays. The temptation to chew things, especially if they’re bright and flashy, can be irresistible to pets. Electrical cords are a particular danger to your animal, as well as a fire hazard, and must be pet-proofed. Make sure to hide any excess cord, cover any exposed cord, and, as much as possible, elevate cords off the ground. There are all kinds of easy-to-use cover protectors to help hide/secure your cords to be found at your local hardware stores. While any decoration can be a potential toy to an animal, there are some that deserve extra caution when using, and, in some cases, should not be used at all. Tinsel and angel hair, while beautiful to look at in all their retro glory, should never be used in a cat household and used with caution around dogs. Tinsel can lodge itself in a pet’s gastrointestinal track with devastating results. Fragile and/or dangling ornaments (particularly with yarn or string) should be saved for the top of the tree where wagging tails and swiping cat paws cannot reach them. Metal ornament hooks can easily be replaced by colourful twist ties to fasten decorations as these are more secure and less likely to fall off a tree than the flimsier hooks. How many photos exist out there of toppled trees and smashed ornaments (Google it…you will be surprised!)? Cats and dog alike can take down a tree, so it’s important to secure it well at its base and, if you have a particularly ingenious animal, from the top as well. For live tree bases with water reservoirs, it’s important to cover the water so animals cannot drink from it; tin foil works well for this purpose. Christmas isn’t the only time of year that animals get into or are given foods they shouldn’t have; however, the abundance of foods on the “naughty list” for animals tends to be higher at this time of year. Many types of food, in small doses, typically do not cause harm; there are, however, certain foods that should be strictly avoided. Turkey bones, candy, chocolate, grapes, and high fatty foods can be very dangerous for pets. Keep your Christmas goodies well hidden; animals aren’t above opening wrapped food items or counter-surfing to get to their desired food object. We have seen an entire bag of Wurther’s Candy (still individually wrapped!) come out of a small dog. Keep a close eye on what your animal is eating. Christmas is more fun without emergency trips to your vet!